I was recently studying the story of how Eminem built up his $400-$600 million net worth, and I was struck by how various efforts throughout his career led to vastly different financial results. The things that made Eminem rich aren’t necessarily the things that you would guess made him rich, and this is also something I suspect Eminem knows given his launch of “Shady Productions” and repeated insistence to own the equity from his efforts during the later stages of his career. I wanted to share with you four of the insights I gained from studying the economic side of Eminem’s life. Eminem built his $400-$600 million fortune by focusing on the ownership of intellectual property and businesses. Image used with permission of Wikimedia Commons. A. Eminem focused on where the profits from effort flowed, and arranged his affairs to capitalize on the insight. When Lucille Ball and Desi Arnaz pioneered the “I Love Lucy” television sitcom, they wanted to position themselves to get rich from their success. If they merely accepted a contract with a studio to make the show, they might have collected $1,000 per episode. And maybe if it were successful, their pay would get bumped up to $1,500 per episode. That’s nice, but it is only a drop in the pool of the wealth that gets created if an entertainment program reaches tens of millions of viewers on a regular basis. So they created Desilu Productions in 1950 so that they would reap 34% of the program’s success rather than exclusive reliance on a predetermined contract rate. If their show reached 35 million people and earned $15 million, $5.1 million would come their way instead of a figure in the tens of thousands. The amount of work required to execute a sitcom, compared to the amount of work necessary to execute a sitcom and administer it through your own studio, is nearly indistinguishable once you get past the initial launch costs. And yet the differential in results can be staggering. Source: Desilu: The Family, The Success, The Productions, and its T.V. Impact. (emphasis added). Similarly-minded entertainers, ranging from Mary Tyler Moore to Johnny Carson and David Letterman, took advantage of this insight to suit their own circumstances by also creating a studio to house the intellectual property that they created. When you look at Eminem’s career, you can see how he built his net worth by trying to minimize one of the weak links in the industry—the fact that you only collect a small portion of the income generated from the sale of your music. 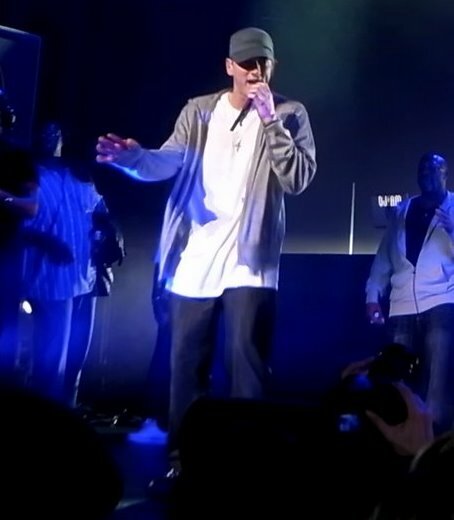 The same effort to produce the song, and yet, having a portion of sales flow back to him via Shady Productions means that Eminem has been able to earn almost five times the amount of income. The structure of your life can be as, and sometimes even more important, than the underlying efforts. Never forget that. B. Not only did Eminem improve his profits from record sales by creating Shady Productions, but he also focused on live performances via tours because that is where the “real money” is. When people think of Eminem, they probably assume he made most of his money by writing the songs “My Name Is”, “The Real Slim Shady”, “Stan”, “Without Me”, “Lose Yourself”, “Just Lose It”, “When I’m Gone”, “Not Afraid”, “Love The Way Your Lie”, “Rap God”, and the other songs that he has popularized on the airwaves and Pandora stations over the past two decades. But that is not where Eminem made his big money. The greatest strides in Eminem’s net worth came from Eminem’s two-year “Recovery Tour” from 2010 through 2012. Not only are tours in general lucrative because it involves customers paying on average between $50 and $150 per ticket compared to the $2-$10 per song or album, but the entertainer is also able to have a higher ownership stake in what he produces. When Eminem went on that concert tour, he owned a staggering 85% of his efforts. He didn’t share this one with Dr. Dre, Universal Studios, or any third parties. As a result, the results were staggering. The Recovery Tour only involved 24 tour dates, but each international touring location generated $3.3 million in profit after paying to rent the stadiums and all the employees to promote the tour and prepare the facilities. Eminem’s share of each performance gave him a bit more than $2.8 million. Do it two dozen times, and you’re looking at $68 million in income. How long is a tour date concert performance? Maybe 2.2 hours. Across 24 performances, Eminem did maybe 52.8 hours of performing. And yet, he collected $68 million. Over that two-year period, he was making about $1.3 million per hour. That was a crazily concentrated period of wealth accumulation for Eminem that eclipses everything else he did in his career. Did he spend more time on those tour dates than he did, say, writing “Lose Yourself” and coming up with a studio recording for it? Nope. Was there anything particularly unique about the “Recovery Tour” that made the efforts there onerous compared to Eminem’s other work product throughout his life? Nope. It was all about finding a niche where there was a high volume of customers, a high $$$ cost per customer, and an arrangement in which Eminem’s ownership claim over those elements was high. If you asked random people what made Eminem rich, I doubt many of them would be able to tell you that the “Recovery Tour” is where he built a meaningful percentage of his net worth. They would probably focus on his most visible songs, and maybe guess something like the movie 8 Mile. But the most visible and professional successes of your life are not synonymous with the best cash-generating. Wealth is built by the number of goods or services you sell, the price you sell them at, and your ownership claim to those two things. From a financial standpoint, everything else is background noise that can, at best, eventually prove of service to those ends. C. Eminem’s Vevo YouTube channel enables him to collect additional income from work he created almost two decades ago. Earlier, I mentioned that people might guess that the movie “8 Mile” played an important role in Eminem’s wealth-building process. That was a bit of tease I set up for a contrast. Guess how much money Eminem made from 8 Mile? Only $637,000. Guess how much it grossed in its first weekend? 8 Mile made $51.2 million its first weekend. Eminem was just a contract claimant who got paid a one-time salary and went on his way. It was the owners of Universal Productions that got to profit from the film’s success. How many hours do you think he spend creating that movie? Maybe 250? He basically got paid $2,548 per hour and that was final—no future sales of the film did Eminem any good, except to the extent that it makes people more likely to watch his songs, buy them, or attend concerts. But the act of the film itself is no source of continual profit for dear Marshall. Compare that to the $1,300,000+ per hour that he earned from the “Recovery Tour” just by structuring the ownership a bit differently. Berkshire Hathaway Vice Chairman Charlie Munger once compared Disney to an “oil well that can put the oil back in the ground after it is done drilling so it can drill again.” His point was that platform innovation, coupled with timeless narratives, meant that Generation 1 would buy “Beauty and the Beast” on VHS and then Generation 2 would come along and buy it on DVD and then Generation 3 would stream it on Netflix. The rise of YouTube has breathed additional life into some of Eminem’s early 2000 songs. Across all of his platforms, he has received 7.6 billion page views (and, in a real-life illustration of the Pareto principle, his collaboration with Rihanna for “Love The Way You Lie” single-handedly accounts for 17% of them). He owns 85% of the channel, and assuming that he earns the average rate of $7.60 per $1,000 page views, this means that his YouTube channel has earned about $58 million and about $49 million of that has personally accrued to him. Every day, Eminem channels generate about 2 million Youtube page views. If he earns $0.0076 per page view, this means that every single day his portfolio of past work earns him $15,200. That adds up to about $5.5 million per year. That is wildly impressive, considering that does not account for new works but is solely an analysis of what he earns in 2017 from a combination of work created between 1999 and 2014. I think Warren Buffett said something to the effect of “If you don’t find a way to make money while you’re sleeping, you’ll never make it rich.” Intellectual property, passive business investments, bond obligations secured by collateral or the taxing power of a government or the general credit of a reliable corporation is just a means of realizing Buffett’s advice. D. Eminem knows that the advantage of owning a business outright is that the P/E ratio is much lower, and therefore, enables you to earn a higher absolute income amount for each dollar invested. This is especially useful knowledge when publicly traded stocks trade at lofty valuations. Did you see that recent article in the Wall Street Journal about the rise of the family office? I don’t think this a coincidence that it is occurring at a time when automation enables business owners to collect higher profit margins and many publicly traded stocks are trading at valuations of 25x earnings. You can still purchase local restaurants, car washes, and apartment complexes at a valuation much less than 10x earnings. You can doably turn a $1 million outlay into a $100,000 stream of income, and that is just not one of the perks that you’ll find in the publicly traded markets. That is why Eminem has purchased an equity stock in the authentic shoe resale business stockx.com. That brings advantages that you just can’t get buying shares in a publicly traded business like Nike. The advantage of owning Nike is that you get a high growth rate and an entirely passive experience. The advantage of buying StockX is that you immediately starting collecting 8-15% of your starting investment as a share of the profits each year while Nike investors get something like a 1.5% dividend yield. Also, psychologically, it can be easier to earn a private business rather than shares of a publicly traded one because there are no daily quotations that can make you worried. If Nike never had a stock quote, their shareholder base would see earnings rise 12-18% each year. It would be a stream of perpetual good news. But because it is quoted daily, and because the investor community tends to get in moods where it overpays for growth, it has experienced a 30% decline between 2015 and 2016. With Eminem’s ownership of stockx, he can just focus on the business growth each year without worrying about how it is valued. If it grows profits from $2 million to $5 million to $10 million, you can focus your attention on the emotional satisfaction from being industriousness in the marketplace without worrying about how people in the hypothetical investor community regard your business at a given time. You get the benefit of tangibility and higher current income without the drawback of volatility (it’s not that the worth of the business doesn’t fluctuate, it’s that your concrete knowledge of those fluctuations doesn’t exist because it’s not shoved in your face daily in the form of a market quotation). The value of this insight varies according to your station in life. If you’re trying to “inventory growth” from your labor efforts, then buying shares of publicly traded corporations like Berkshire Hathaway, Johnson & Johnson, and Colgate-Palmolive and focusing on improving your labor marketability might eb the wisest course of action. If you are wealthy enough to buy gas stations and duplexes, you can get decent income streams going right away with the caveat that it comes with an effort requirement that doesn’t exist when you buy shares of Johnson & Johnson which lets you delegate management functions to the Board and officers. Eminem has only made a pittance of his fortune from selling his time. When you look at his acting gigs, you’ll see that the most he ever earned was the $637,000 from 8 Mile. His appearances on “50 Cent: Bulletproof”, “Funny People”, and “The Interview” only netted him $100,000. If Eminem only sold time for money as a contract employee, and didn’t own anything, it is doubt that he would even have $10 million to his name. On the other hand, he has retained interests via Shady Productions, his YouTube Channel, his continued music sales, and his investments in things like StockX that make him money while he sleeps and offer has a capitalized resale. Earlier, I talked his $15,200 or roughly $5 million per year YouTube channel. If he wanted to give that up, he could fetch anywhere from $35 million to $80 million in exchange for giving up his YouTube/VEVO ownership rights. I am not suggesting that he should do so, but rather, is my way of pointing out that the asset represents so much more than the income it generates per day because it is sale-able. There are a lot of serious business men out there who wouldn’t mind collecting the $1,000 per day that Eminem makes from the legacy page views of the “Love The Way You Lie” music video alone. I’ve never heard Eminem give an interview about the financial success of the “Recovery Tour”, but I imagine it has significantly his shaped his life. Only 52 hours of performing gave him about $68 million. Likewise, that $456,000 gets deposited into his bank account each month as people continue to watch “Not Afraid” and “Lose Yourself” on YouTube. If you are an industriousness individual, and you want to leverage the financial rewards from your effort, you can learn a lot by looking to how Eminem built his net worth and noting what did and did not move the needle on his half-a-billion-dollar fortune.